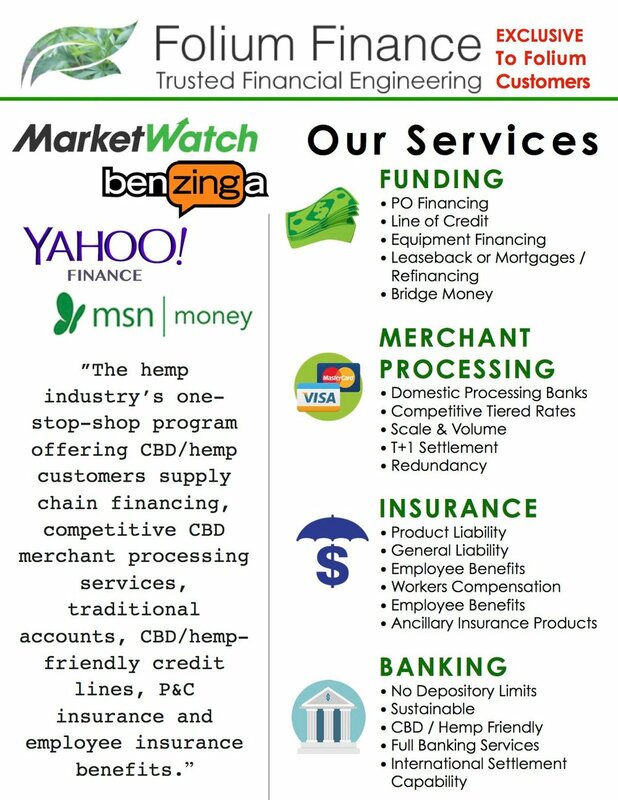 Company's Bio (Pitch Deck): HLG is a leader in providing professional services to the cannabis industry, which is comprised of the hemp industry, the regulated marijuana marketplace, their ancillary service providers (finance, capital markets, compliance, etc. ), and their international counterparts. Industry participants require more than top-notch legal services; they require a specialized skill set from their legal counsel to succeed; they require industry expertise to navigate unprecedented business challenges in this nascent industry; they require a large-scale leading-edge cannabis industry network to more efficiently achieve their goals. Since 2009, the Hoban Law Group has served that role. We help companies grow and succeed, from raising capital to licensing, to operations and compliance, and to exit/acquisition. Our clients are businesses, family offices, venture capitalists, private equity funds, and publicly traded companies. HLG is the Nation’s first (since 2009) full time, a full-service business-oriented law firm serving the cannabis industry exclusively. HLG is also the first U.S.-based law firm to expand its cannabis industry services across the globe, with attorneys in the European Union, Latin America, and beyond. With these resources, HLG builds out client asset portfolios within the global cannabis economy. We serve businesses large and small, from established industry titans to early-stage startups. Approximately half of our business flows from the industrial hemp side of the industry, and the other half from the regulated marijuana space. These two sides of the industry present a different challenge and require unique legal expertise. This has caused HLG to pivot and build out a team of experienced attorneys to handle each segment’s distinct legal needs. Because what we do is unique, we coined the term “cannabusiness” to aptly describe our practice. And because of what we do, who we are, and who we represent, HLG’s network is truly the largest cannabis industry network in the world. As a result, we have been working with the industry’s leading brands, companies, and ancillary players for nearly a decade. With a distinctive combination of legal skill and business acumen, we help our clients’ businesses succeed in the extremely competitive cannabis marketplace. HLG attorneys have extensive experience with the wide array of issues which include: raising and deploying capital, industry due diligence, public company representation, land use and zoning, International trade transactions, corporate formation, FDA, securities and SEC filings, operational challenges, global strategies (E.U. Latin America, etc. ), governance and structure, mergers & acquisitions (M&A) advisory , including start-ups, intellectual property, litigation, banking and finance, real estate issues, compliance and regulatory matters, state/local licensing, and tax strategies. We combine deep industry experience with state/regional/global insight to help businesses stay informed and legally compliant as the industry evolves. We have gained international distinction for providing elite cannabis industry consulting and full-service legal solutions for our international clientele. HLG’s depth of experience provides our clients with a competitive advantage when it comes to reaching their goals wherever they are located. C-Suite Bio's (Pitch Deck): Bob Hoban is the Managing Partner at Hoban Law Group, the nation's premier cannabusiness law firm, with attorneys in over a dozen states and abroad. Bob is recognized as one of the leading commercial cannabis practitioners nationwide; representing private and publicly-held clients in numerous states and abroad. He has litigated nearly every aspect of Colorado’s Marijuana Code and has closed over 300 marijuana-related business transactions. Marijuana and hemp-based business operations, related litigation and regulatory counsel are a specialty. Bob is formerly a professor at the University of Denver, in the Law and Society Program, and regularly instructs regarding government regulations, public policy, and research-based policy courses. Furthermore, Bob has drafted more than 30 bills for the Colorado General Assembly (eminent domain/land use, hemp/marijuana and transportation). Bob is currently a member of the Colorado Department of Agriculture’s Industrial Hemp Advisory Committee, as well as Board Member/strategic advisor for New Frontier Data and Athletes for Care. He is a member of the National Cannabis Industry Association, National Hemp Association, Hemp Industries Association, and the National Cannabis Chamber of Commerce. Since 2010, Bob has been rated as “Superb” by Avvo.com. Since 2013, Bob has been rated AV® Preeminent™ by Martindale-Hubbard. Brent Johnson is the Managing Attorney has over 20 years of legal, finance and executive-level management experience at numerous small and large-sized growth companies, law firms and investment firms. He has managed, executed and participated in over $2 billion in capital raising, private equity, venture capital and M&A transactions. He has assisted in the oversight, management and compliance of multiple investment funds with up to $100 million in assets under management. He routinely advises entrepreneurs, investors, executives, operators, fund managers and companies regarding entity formation, transactions, capital raising, structure, finance and operations. Brent is also an advisor and mentor to numerous companies and investment funds in the cannabis industry. Growth Plan (Pitch Deck): With attorneys licensed in nearly every state that has embraced legalized cannabis, our team is prepared to work with investors and owners considering entry into the marketplace or looking to expand into new markets. From the marijuana business and hemp to licensing and trademark protection, to commercial litigation and environmental law; our combined experience uniquely qualifies us to successfully navigate the complex and rapidly emerging field of cannabis law to achieve the best possible outcomes for our clients.